Potato Salad by Debbie Moose is a wonderful cookbook to have on your summer cooking shelf. The book contains 65 different recipes which all have me drooling and wanting to try each and every one! 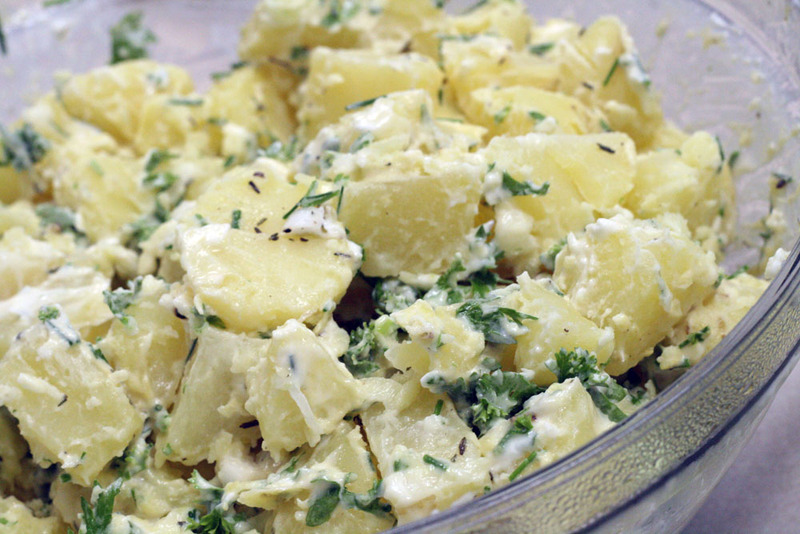 I tried the Herbs and Garlic Salad which was so good that it will become my go-to recipe for potato salad. Place the potatoes in a large pot, add enough water to cover them, cover the pot with a lid, and bring to a boil. Cook until the potatoes are pierced easily with the tip of a sharp knife, 15 to 20 minutes. Drain and let cool until you can handle them but they are still warm. Peel and cut into approximately 1-inch pieces. In a large bowl, stir together the garlic, parsley, chives, onion, mayonnaise, Dijon mustard, celery, salt, and black pepper. Crush the thyme lightly with your fingers and stir it in. Add the potatoes and toss until coated. Cover and refrigerate for several hours to overnight. I also tried the Pesto Potatoes which is meant to be served at room temperature. It was a nice twist to an old classic, but the cold leftovers were kind of nasty (in my opinion -- others disagreed). However, this Potato and Beet Salad was amazing! I'm a big fan of beets and thought this salad not only tasted great, but looked beautiful too. 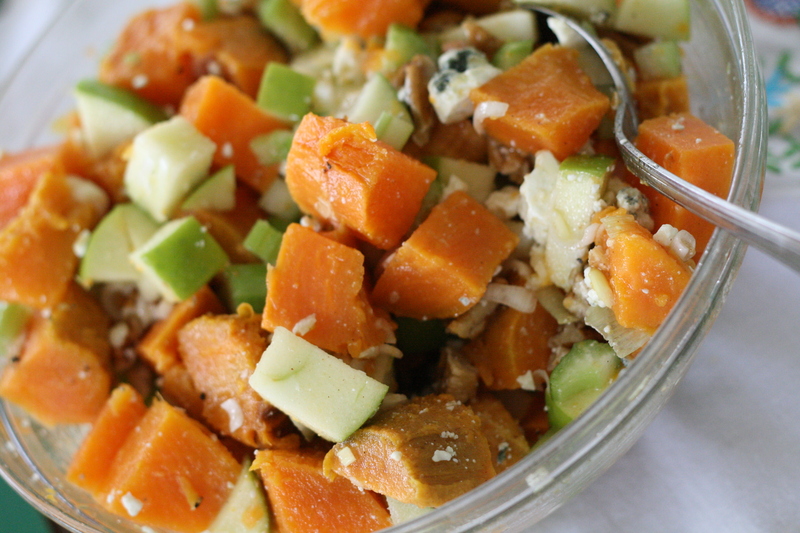 And this Sweet Potato Waldorf Salad was an interesting twist on an old classic. I added blue cheese and those of us who like new and daring flavors enjoyed it. As you can see, trying new potato salads has become addicting. 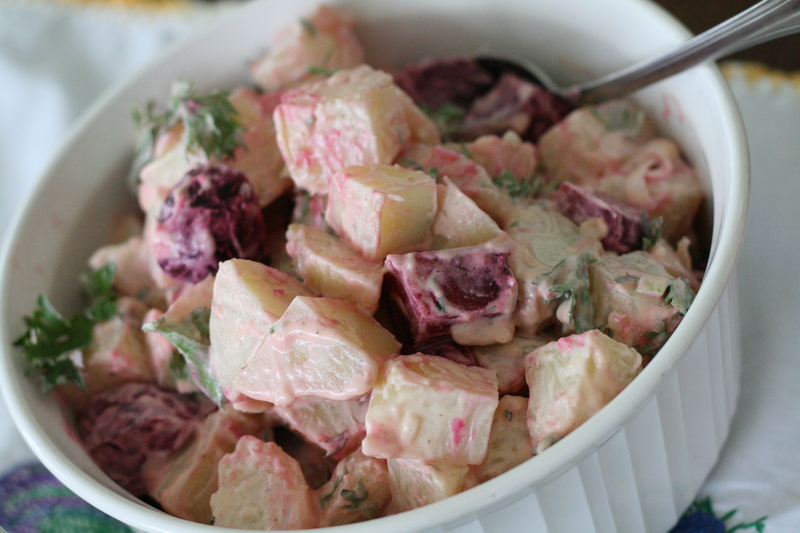 The beet potato salad sounds/looks far better than the herbs and garlic salad. Though, to be fair, that much mayonnaise turns me off of pretty much any dish. Also, your addition of blue cheese to a fantastic looking dish really makes me want to give it a try. I LOVE potato salad!! Thanks for the ideas :-D I really must try out the Herbs and Garlic Potato Salad. It looks amazing and I love lots of mayonnaise to make it really moist and yummy!! 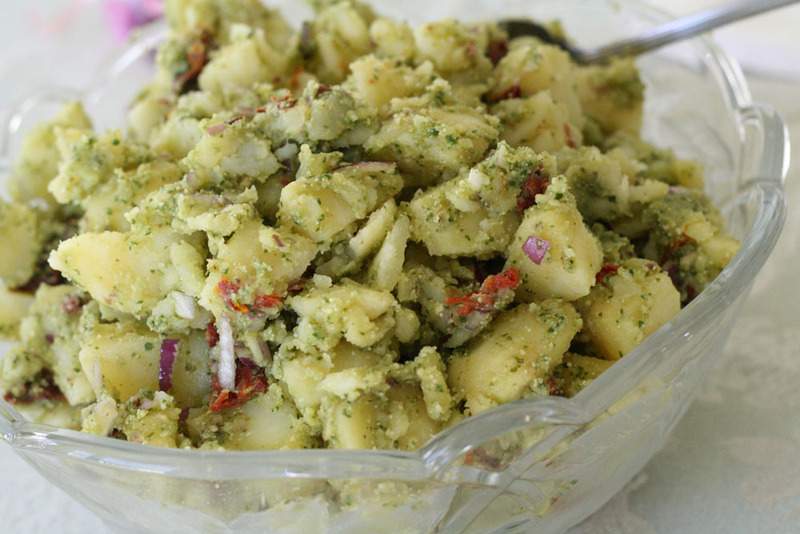 I will be trying the herb potato salad. It looks great. I am on the quest for a good recipe.